Graphics. The characters are surrounded by a black outline. See this screenshot (and others) on IGN. It reminds me of cartoons, where the outlines help separate the important characters from the backgrounds. It's more than this though. Silverfall's graphics look hand drawn, at every angle and zoom. I can't figure out how they did this. Physics. It can take advantage of a physics accelerator card. I didn't see much that would benefit from physics though, and it's sort of annoying to have to install a physics library. UI. The UI is really smooth compared to Dungeon Siege, although not quite as nice as Diablo 2 for reasons I'll list below. The use of the mouse and hotkeys is nice. Factions. The nice twist on this type of game is Nature vs. Technology. When you complete or reject certain quests, you gain favor with either nature or technology (these are diametrically opposed). When your favor with either faction increases, you gain access to better items and skills. Also, in the story your faction becomes stronger, which changes the storyline and the appearance and buildings in the city. A third path is to favor neither side, accepting quests on behalf of both. This gives you more experience from quests, but you no longer have access to the special items from each faction. Quests. A consequence of the nature vs. technology factions is that some quests will make you worse off. In most RPGs, the more quests you do, the better. But here, the quests can hurt your standing with one of the factions, and you can lose access to items, skills, and further quests. So you need to think about which quests you accept. Skill Tree. Like Guild Wars and unlike Diablo, you can change your skills, at a cost. I think this increases the enjoyment of the game the first time through, because you can try out several approaches without starting over, but it may decrease enjoyment the next time through the game. It's a good tradeoff though, because it helps a large number of casual players at the expense of a small number of dedicated players. Classes. There are races but no character classes. Instead, you can choose your skills to build your own style of character. There are skills for melee, ranged weapons, light magic, dark magic, faction (nature or technology), and your race (human, goblins, trolls, elves). This yields a large set of styles of play. I tried one which combined melee and dark magic, and a different style that combined light magic and nature skills. It seems silly, but I think the black outlines and the hand-drawn look of the characters and other objects are a sign of something important. Before 3d accelerator cards, graphics were drawn by programmers and artists, and games had lots of different visual styles. With 3d cards, a certain style supported by the card is cheap, fast, and easy. All other styles are more expensive, slower, and harder to program. This has led to a far less diverse set of visual styles. Okami is a rare exception. (Side note: I'm not sure how the Silverfall developers implemented their outlines. At first I thought it'd be a single pass over the buffer to look for differences in Z values, but when you zoom in you can see the outlines are at the vector level, not the pixel level, so it's possibly a shader that looks for normals perpendicular to the screen. And I have no clue how they made everything look hand-drawn.) In old-style art, it was easy to identify objects. You could tell what was clickable, what was a button, where a person was, etc. Artists weren't looking for realism. They wanted to express concepts and emotions and ideas in game art. Newer games tend to be cluttered. Just look at how much harder it is to see all the objects in The Sims 2 vs. The Sims 1. Newer games are more realistic, but less artistic. The harder it is to see what's on the screen, the more effort the player makes in seeing things, and the less effort the player can make in deciding things. Although there are games like Quake and Halo where much of the challenge really is in seeing things, I don't think RPG and strategy games fall into that category. I like games where the challenge isn't in seeing the objects on the screen, but in deciding what to do. I hope the shaders in graphics cards enable game developers to explore more visual styles. Camera rotation. I spent way too much time rotating the camera in Silverfall (and Dungeon Siege). I spent no time doing this in Diablo. Does rotating the camera add to the game? No, I don't think it does. Yes, it's “cool” and people seem to expect it, but it didn't make the game better. In fact, it made it worse. Zoom. You can zoom in to see your character close up. The character looks really nice when zoomed in. But this mode is useless when actually playing the game. For playing, you want to be zoomed out as much as possible. (In fact I'd like to zoom out even farther than Silverfall allows.) This means that all the effort to make the zoomed-in camera work (for example, distant objects, level-of-detail terrain, and expensive high-resolution texture art) is a waste. Unfortunately you need some of this to put on the box so people will buy your game. But it's a big waste. Loading zones. When you travel from one zone to another, the game stops and loads the next zone. That's a minor annoyance. The big problem is that all your spells are cancelled. Techniques for avoiding loading screens are well-known. I don't mind if there's loading when you enter a tunnel or cave or dungeon. It's when you see arbitrary boundaries unrelated to the game that it becomes annoying. Terrain. The demo takes place in a swampy region. The terrain is very bumpy. It looks like it was randomly generated (maybe Perlin noise?). The small problem is that the random-looking terrain adds nothing to the gameplay. It just gets in the way. The big problem is that the slopes that are walkable and the slopes that are not at not distinguished in any way, except by clicking and finding that your character doesn't move. At the very least the cursor should change color or shape to indicate that some area isn't accessible. Map. This is actually a complaint about lots of games. If I were Indiana Jones and I had to go to 3 places to collect artifacts, I'm going to mark those 3 places on my map. Far too many games have a notion of an “active” quest, and only show that one place on the map. No! Make the map work like I would actually use it. Show me all the important places I need to keep track of. Let me add markers. Let me add notes. Let me draw lines. Don't make me keep a second map on paper because your map is so lame. Quest Listing. There are some bugs in the Silverfall quest list, which I'm sure they'll fix before release. For example, it doesn't remember where you were the last time you brought up the list. A bigger problem though is that the quests do not keep track of who assigned the quest (and where). I found myself often re-reading quest descriptions, trying to guess who would have assigned such a quest. Some of them are on the map and some are not. Some of them trigger the rewards automatically and some do not. It's a mess. Just as with maps, the quest listing should match what I would do on paper. I would keep track of who gave the quest, where I need to go, and what the potential rewards are (especially related to faction). I would allow adding notes, assigning priorities, and sorting the list. For example, there was one quest I received that I was not ready to do. I'd like to move it to the end or otherwise mark it as “later” so that it doesn't clutter up the list of active quests I want to work on. And if the map shows all quests, it should also use different markers for active and postponed quests. Trees. I've saved my biggest complaint for last. The graphics in Silverfall are great. I admit that. The problem is that the swampy area has lots of trees. In the default zoomed-out view, the canopy of trees blocks your view. So the game very helpfully hides the leaves. In addition, tree trunks block your view. So the game very helpfully hides the trees near your character. But tree trunks still block your attacks. So you now have a completely mysterious and maddening situation in which invisible objects block your attacks. Your attacks are blocked and you can't see why. This is truly bad. Just get rid of all the trees. They don't add anything to the game. Alternatively, since it's unlikely the developers will do that at this point, just let me walk and attack through the trees. About a year ago I decided to stop working on Simblob, and started working on a transportation game (more about the design here and here). My progress has been rather slow, in part because I keep playing other games instead of writing one. Buffers. Goods come in, a stored for a time, and then go out. The time the goods are supplied is earlier than the time they are needed. For example, it may take several months to produce the toys that will be bought in the Christmas shopping season; those toys need to be stored somewhere until shoppers are ready to buy them. Switches. Goods come in from several sources and go out to several sources. For example, a grocery store chain may have supplies coming in from farms, ranches, orchards, etc., and may have those same goods go out to several neighborhood stores. Caches. Goods aren't needed all the time, and their demand is unpredictable, but when the demand is there, the customers want the goods right away. The solution is to keep some near the customers, so that when they need some, they can get it quickly. Transformer. Goods arrive in one condition but leave in a better condition. For example, a Warehouse may add tracking, labeling, and pricing information to the goods before sending them on to stores. Multiplexing. Goods arrive in large shipments from suppliers, but each store needs a small amount of each good. The Warehouse can repackage the goods into smaller units. For example, an electronics retailer may receive a truck full of VCRs, a truck full of TVs, and a truck full of speakers, and the Warehouse can reshuffle these into three trucks, each with VCRs, TVs, and speakers. That way only one truck has to be sent to each retail store. Warehouses are an interesting enough part of this game that I decided to try making a mini-game out of them. In the mini-game, the goals (switching, multiplexing, etc.) are given to you, and your job is to design the warehouse to meet those goals. Goods come in from the left and exit on the right. There are multiple types of goods, each represented by a color (or shape). Your job is to get the goods from the left to the right, while achieving your goals. The warehouse is laid out on a grid. 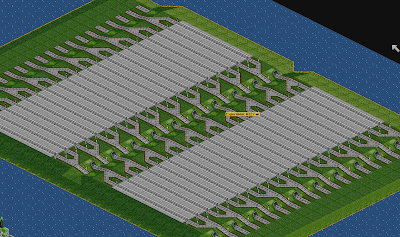 The basic component is a conveyor belt, which takes up 1 grid space. The conveyor belt pieces are linked into a chain that defines the flow of goods through the warehouse. 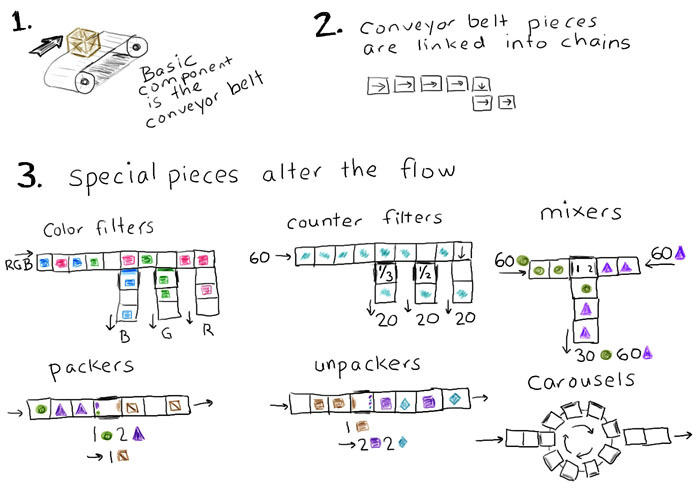 What makes the game interesting (I hope) is the special pieces you can add to the conveyor belt. A color filter only allows a certain color to pass. With it you can separate a mixed flow into separate products. Similarly, a shape filter only allows a certain shape to pass (I may end up combining shape and color filters into one). A counter filter has a counter, and only allows an object to pass when the counter reaches a particular value. For example, a 3-counter filter will allow every third object to pass. These filters are used to separate a stream of objects into smaller streams. Note that a 1-counter is the same as a regular conveyor belt; it filters nothing. A mixer mixes objects from multiple streams, in some proportion. For example, a mixer can be set to take 1 green circle and 2 purple triangles, and the resulting stream will have twice as many purple triangles as green circles. A packer takes multiple objects and packs them into a single object of a different type; an unpacker takes a single object and unpacks it into multiple objects. A carousel stores objects, up to its capacity, until the output stream(s) have space for unloading objects. It can be used to even out a highly variable flow. There are more objects I can imagine: shelves, aisles, employees, forklifts, labelers, inventory trackers, etc. 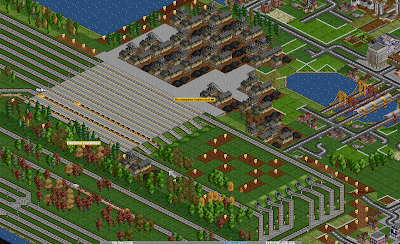 The game involves a series of levels of increasing difficulty. Each level has a grid, some supplies, some demands, some parts to use to construct the conveyor belt network, and some goals to meet. 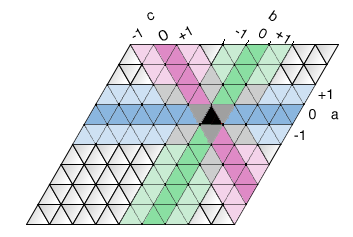 The grid may have objects on it already, which cannot be moved. The conveyor belt defines the directions the object can move. An object cannot move in the direction of an incompatible filter. An object cannot move to a spot that has an object, unless that object is about to move. Of all directions available to move, the object chooses one at random. If a box cannot move, it sits still. If it sits still too long, it breaks. If you think about these rules hard enough, you'll see that they may be difficult to implement. In particular, rule #3 says that an object can move if another object can move. And that object too may be subject to this rule, leading to an entire chain of dependencies that have to be solved. I have an algorithm partially designed but I'm not yet convinced my algorithm will work; if it does not, I'll revise the rules. Slow packers. Split the incoming supplies into several streams so that you can have several packers handling them, then coming the streams into one. Irregular supplies. Demand is steady. Build a large buffer so that you can handle supplies being late. Multiplexing. As described in the electronics retailer example, suppliers send large shipments of a single product type. Build buffers so that you'll have enough of each product type. Unpack the large supplies into small ones, mix the goods together, pack them into shipments that get sent to retailers. Bad supply. Some of the incoming goods are faulty. The supplier will lower quality as much as he can get away with. It's too expensive to check everything, but if you check nothing, the quality will keep going down. Check some of the goods to keep quality high enough to satisfy customers. Time, quantity, quality, costs, and profit can all be part of the goals. For example, incoming goods might cost $4/box, and outgoing goods might bring in $5/box. Each box you send through the system gives you $1 in profit. If a box breaks (due to sitting on the conveyor belt for too long), you lose the $4. You might be willing to have a less reliable system to keep costs down, or you may want to make it more reliable to minimize losses. At this point the design is only on paper. I plan to create a prototype soon to try to judge how fun or interesting the game might be. Updates: [2014, 2015, 2016, 2017] See Great Permutator's clever puzzle pieces; also see Manufactoria, Factorio, Big Pharma, Blueprint Tycoon, and Production Line.